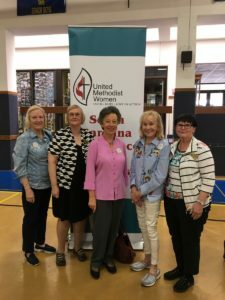 Several members attended the annual SC United Methodist Women (SCUMW) Legislative Day in Columbia on February 20, 2018. The theme this year was “Can’t You Hear Their Cry”. Legislators gave an update on important issues to SCUMW. The group separated to attend workshops. The keynote speaker was Karen Wright-Chisolm, author of “Camouflaged Sisters, Silent No More!” What a powerful presentative and story she shared with all of us. On our way home, we visited SCUMW supported Killingsworth Home with donations from our members. It was a wonderful and inspiring day together.